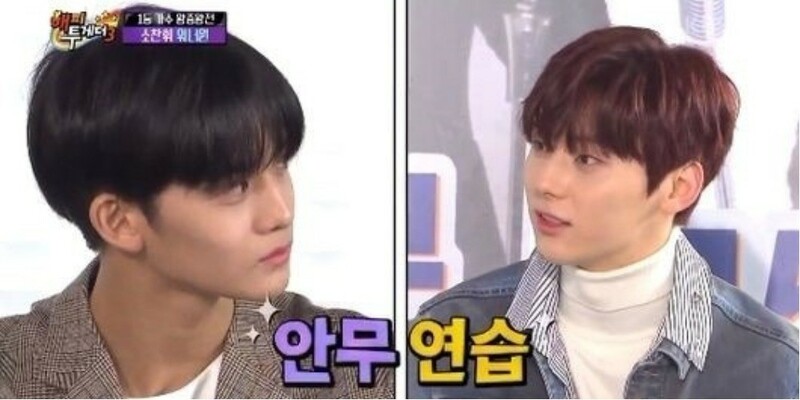 Wanna One's Hwang Min Hyun revealed Bae Jin Young's overly ambitious side. On March 22, members of Wanna One, Davichi, So Chan Whee, and Highlight�guested on 'Happy Together 3'. During the show, Hwang Min Hyun shared, "Bae Jin Young is very ambitious and that shows the most during dance practice. One person kept on standing out when we were fitting the choreography together. Bae Jin Young always overreacts when he dances. We tell him, 'Let's all do it the same way', but he replies, 'This is my style'." Kang Daniel�and Hwang Min Hyun then demonstrated Bae Jin Young's 'ambitious dance', bringing much laughter. Seeing their demonstration, Yoo Jae Suk�commented, "It does seem too much." However, Bae Jin Young said, "Hyungs are just exaggerating."